Based on late bloom and a mild spring, it’s a good bet that prune harvest won’t really get started until the middle to second half of August this year. If July and August temperatures are hot, it might be the last week of August before prunes are mature in the Sutter/Yuba area. Harvest can be a nerve-wracking time in the prune business. The finish-line – when the entire crop is in the bins – may be in sight, but there are still tough decisions to be made that influence your bottom-line. One of the most important decisions to be made is when to start harvesting. With trucking, dryer space, and a custom harvester lined up – and perhaps pressuring you so they can go to shake pistachios – there is an understandable urge to get started early. However, harvesting too early can cost you money. French prunes are mature when flesh pressure falls below 4 pounds; until then, the fruit is still increasing sugars –gaining dry weight (Figure 1) – and putting money in your pocket. Figure 1. 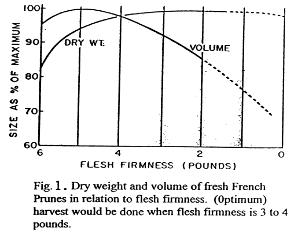 Dry weight and volume of fresh French prunes in relation to flesh firmness. Optimum harvest would be done when flesh firmness is 3 to 4 pounds. Once fruit reaches 4 pounds pressure, soluble sugars continue to increase, but only due to natural dehydration of the fruit and not to movement of sugar into the fruit from the rest of the tree. Using refractometer measurements (sugar levels) to time harvest can be misleading, as sugar levels are primarily influenced by crop load, NOT fruit maturity. Waiting for sugar levels to climb in heavily cropped orchards while fruit becomes excessively soft (less than one pound fruit pressure) risks excessive fruit drop and/or reduced quality due to development of gas pockets and flesh darkening. The key tool to schedule harvest is a fruit pressure gauge, with a refractometer to measure sugar levels providing important details. The recommended approach to timing prune harvest is to measure fruit pressure once a week beginning once the fruit skin first shows purple. Fruit pressure generally drops 1.5 pounds pressure (faster rate in cool weather, slower rate in hot weather) and sugars increase around 2% per week. Sampling details are found in Chapter 24 of the Prune Production Manual (UC ANR publication No. 3507). In a year like this, with variable crop loads from block to block, growers can help deliver the best quality and most valuable crop by starting to harvest orchards with lighter crops (and higher sugars) first. Let more vigorous blocks with a heavy crop load wait to accumulate more dry weight (sugars). Growers must balance the income gain from waiting to harvest with the logistical pressures from custom harvesters and handler, as well as the potential risk of weather changes (wind and/or rain) when deciding which orchard and when to begin harvest. Choosing when to harvest is one of the most important decisions for your bottom-line you will make all year.